Looking for fun gift ideas to encourage creative kids? Here are some books and ebooks that we co-wrote, love and recommend! Written by 94 co-authors (including myself), this book features engaging, hands-on activity suggestions for babies, toddlers, preschoolers and kindergarteners. Fun ideas for years and years! 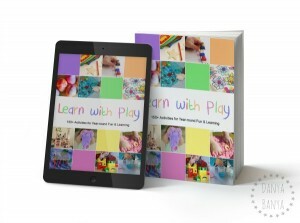 Find out more about the Learn with Play books here. This ebook is a collection of fun, hands-on, play-based ideas that will help your child explore and build on their letter and math skills. Aimed at 2-8 year olds, this is a collaborative effort of over 40 like-minded bloggers (including myself), who believe kids learn best through play. 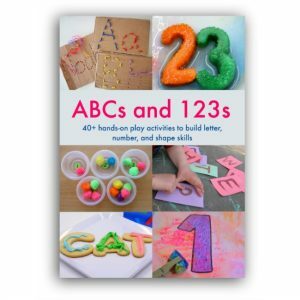 Find out more about the ABCs and 123s eBook here. * This page contains affiliate link(s). An affiliate link means I may earn referral fees or commissions if you make a purchase through my link, without any extra cost to you. It helps to keep this little blog afloat. All opinions are my (or my kids’) own. Thanks for your support.